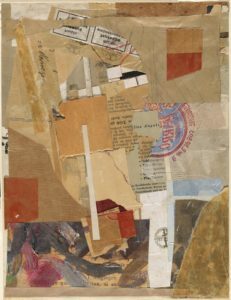 This significant exhibition constitutes the first one-person exhibition of Kurt Schwitters’ work in Douglas, the Isle of Man, the site of his internment as an ‘enemy alien’ after fleeing from Nazi Germany and Nazi occupied Norway. Curated by Fran Lloyd, Kingston University London, the exhibition marks the 65th anniversary of his death in Kendal and commemorates his internment on the Isle of Man during World War Two. 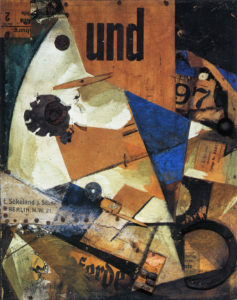 The sixteen months that Schwitters spent on the Isle of Man in Hutchinson Square camp, from 17 July 1940 to 22 November 1941, are important in terms of the distinctive work that he produced – particularly portraiture, landscape, collages, experimental assemblages, sculpture, Merz poems and performances – and the friendships that he forged with fellow internees including artists Fred Uhlman, Hermann Fechenbach, Erich Kahn, Hellmuth Weissenborn and Paul Hamann, and art historian Klaus E. Hinrichsen. Kurt Schwitters: Responses to Place focuses on Schwitters’ years in exile in the British Isles and the multiple ways in which his work responded to the varied circumstances and changing environments of internment and the Isle of Man landscape, his subsequent move to wartime London, and then in June 1945 to the Lake District, where he died in January 1948. The exhibition includes twenty-seven Schwitters’ works – paintings, collages, assemblages and sculptures – an audio recording of his famous Ursonate performance in London in 1944, and archival material. Works have been generously loaned by the Tate; the Sprengel Museum, Hannover; Abbot Hall Art Gallery, Kendal, Cumbria; the Armitt Museum and Library in Ambleside; the Hatton Gallery, Great North Museum, University of Newcastle; IWM (Imperial War Museum); the Manx Museum, Douglas, and various private collections. With a particular focus on Schwitters’ activities in Hutchinson Square, the exhibition brings together for the first time in the Isle of Man twenty-seven works produced by the artist in Douglas. These include portraits of fellow internees Fred Uhlman, Klaus E. Hinrichsen and Georg Heller; the Untitled Abstract Oval gifted by Schwitters to Captain H O Daniel, Commander of Hutchinson Camp, as part of a bound book containing the work of 19 internee artists, and Untitled (Rooftops of Douglas). Alongside these works are drawings, letters and photographs exploring camp life, Schwitters’ contributions to the camp’s paper and exhibitions, and selected examples of the work of his fellow Hutchinson internees from 1940 to 1941: Bruno Ahrends, Ernst M. Blensdorf, Hermann Fechenbach, Erich Kahn, Johann Schreiner, Fritz Solomonski, Hellmuth Weissenborn, and Fred Uhlman.